picTrove 2 is now available on Android! We’re proud to announce the availability of picTrove 2 on Android! For the first time, we’re using the “Freemium” model to deliver our most popular app to you. 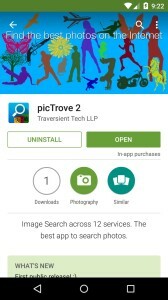 picTrove 2 is free to download on the Google Play store, and lets you perform Image Search to simultaneously see results from 12 Internet Services. All functions are available for free, but only as long as you’re using the most popular Google Images service. To see full photos from any of the other 11 services, you’ll have to purchase the in-app Pro Unlock to get immediate, permanent access to all current and future features! Most features from the ever-popular iOS version are included, check out the picTrove 2 for Android page for more details. This entry was posted in picTrove Releases, Releases by TraversienT. Bookmark the permalink.